The following is the essence of the teachings of the Hindu Vedic scriptures. The human form of life is the most important and the most valuable. Humans possess far greater knowledge than other creatures. While other creatures possess knowledge pertaining to only the body, humans have access to knowledge pertaining to the material body as well as the spirit soul. Only humans can attain the knowledge of God. Even devtas (celestial gods) desire the human form. The reason is that humans alone reap fruits of their actions. Humans not only taste fruits of actions of previous lifetimes (known as destiny), but also taste fruits of actions performed in the present. Devtas merely reap fruits of previous actions but are not held accountable for actions of the present life. They must be born human to make spiritual progress and thereby attain God. One disadvantage of human form is that death may come any moment. Consequently, we must embrace the Godly path without procrastination. Life is as temporary as that of a bubble that appears in water one moment only to disappear the next. Prahlad says to his little friends, "Do not wait until you are older, to know God. Death may pay a visit any moment to any one of us." Every living creature is engaged in work. Works are of two types; physical + mental, and only mental. The body may or may not be involved in the performance of a work, but the mind is always involved. Mind motivates all activities, which means that there is a motive behind every action of every individual being. What is our motive? We want happiness. Philosophers say that we desire Immortality, Knowledge, Freedom and Power also, but the Bhagvatam instructs that these are mere means of attaining happiness. Every creature desires happiness. Everyone is so different from one another. All look different; have distinct tastes; think differently, but all want only happiness. Why?Reason: All are part of God, and every part desires to unite with the whole. Being part of God, all desire to unite with Him. Vedas tell us that God is happiness, and that the individual soul can attain happiness only by attaining God. The Vedas and Shastras say that there is no means of attaining God. God is beyond the reach of limited and material senses, mind and intellect, and these are the only three criteria through which a human attains knowledge. Material mind and intellect fail to comprehend even material phenomena, what to speak of God! Moreover, God possesses innumerable mutual contradictions within Him. He is bigger than the biggest, yet smaller than the smallest. He is without name and form, but also with name and form. He is farther than the farthest, yet nearer than the nearest. God does not take birth, yet takes birth innumerable times. For all these reasons and more, it is impossible to know God with material senses, mind and intellect. Finding out that God cannot be known, is very disappointing. But the Vedas instill hope in our hearts by clarifying that though He cannot be known through self-effort, yet He can be known through Divine Grace. When God bestows grace, the material senses, mind and intellect become divine, and then they can see, hear, taste, touch, smell and know God. It was only after being granted divine eyesight by Lord Krishna that Arjun was able to behold the Lord's universal form. The mind continually generates thoughts regarding the world, because it desires people and objects of the world. Desire is the most damaging disease that afflicts the mind. Anger and greed are born of desire. If a desire is fulfilled, it leads to greed. If unfulfilled, it leads to anger. Why does the mind desire the world? Because of attachment. Why does the mind get attached anywhere in the world? Because of continually thinking the world to be a source of happiness. Why do we constantly look for happiness? Because being part and parcel of God, it is our natural desire to find happiness, which is another name for God. All would be happy in the same limit. Using these three criteria as the measuring stick, we come to the conclusion that real happiness cannot be found in any worldly individual or object. Constant reflection on this brings about detachment from the world. What more needs to be done? Beyond the mind is the intellect. It is the intellect that decides, and it is the mind that desires. Sometimes mind and intellect are referred to collectively as just the mind; sometimes individually as the mind and intellect. If the mind which desires the world, is governed by the intellect that decides that there is no happiness in the world, detachment from the world will come about naturally. We see that desires are unending. When one desire is fulfilled, many more are born. Although an individual keeps getting older, his desires are constantly rejuvenating themselves. According to scriptures, a wealthy man is not one who possesses more; he is one who desires less. According to scriptures, there are 3 paths leading to God: KARM, GYAN, BHAKTI. First we shall look at Karm. What is Karm? It is Varnashram Dharm. Vedas and Smritis specify certain duties that are to be performed according to one's Varn (caste), i.e. Brahmin, Kshatriya, Vaishya, Shudra, and one's Ashram, or stage of life (celibate, householder, forest-dweller, renunciate). The path of Karm is both praised and condemned by Vedas and Shastras. Even Divine Personalities like Seeta, Lakshman, Bharat, Prahlad and the Gopis rejected the path of Karm-Dharm. 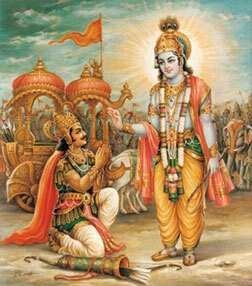 Uddhav asks Shri Krishna why so many paths came into being in the first place. Shri Krishna explains that He had specified one path for all in the Vedas. However, different interpretations of the Vedas came about in accordance with the individual interpreting them. Some paths came into being simply due to tradition. Some say Karm-Dharm is the true path; some say that to earn name and fame is the true path; for some fulfillment of desires is the true path; for others, it is in telling the truth that salvation lies. According to some, sense-control is the way to God; for some, fasting. Are any of these genuine? Shri Krishna says no, since none of these leads to God. Which is the true path? We shall continue searching. There are 4 principles in the path of Karm: Karm, Vikarm, Karmyog and Karm Sanyas. Karm is of four types: Nittya Karm (daily duties), Naimittik Karm (occasional duties), Kaamya Karm (duties performed for desire-fulfillment), and Prayashchitta Karm (duties performed for repentance). There are six most difficult conditions to be fulfilled if this path is to be followed. The fulfillment of these six conditions leads one to the celestial abode, but not to God. Karmi does not practice devotion to God, but does follow the dictates of Dharm, and hence goes to Svarg after death. Vikarmi is one who neither practices devotion nor follows rules and regulations of Dharm. He is sent to suffer the torments of hell after death. 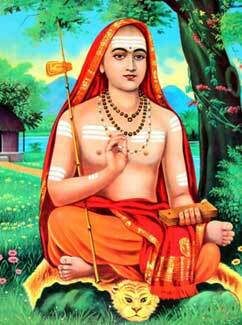 Karmyogi is one who practices devotion and follows rules of Karm-Dharm. 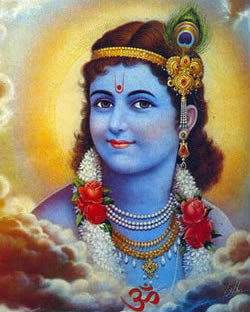 He attains God because of devotion to God. Karm Sanyasi is one who follows principles of devotion but renounces Karm, and he also attains God. Path of Karm is praised when it includes devotion; it is condemned when it excludes devotion. The Divine Ones who rejected Karm, are not at fault, for they renounced Karm in favor of devotion to God. Gyan is Knowledge. Knowledge is of two types: theoretical and practical. Mere theoretical knowledge, without any practical experience leads one to become proud. Hence, mere theoretical knowledge is condemned by scriptures. Knowledge equipped with practical experience is praised by scriptures. Practical knowledge is also of two types: Atma-gyan (knowledge of the self) and Brahm-gyan (knowledge of God). Atma-gyan is only partial knowledge of God, since the Atma (soul) is a part of God. The gyani says, 'I am God.' Devotee says, 'I am a servant of God.' Through Gyan Sadhana the gyani transcends the five elements and the ego; he attains Nirvikalp Samadhi (in which there are no thoughts), but he cannot attain liberation without practicing devotion to Shri Krishna. The reason is that Rajogun (mode of passion) and Tamogun (mode of ignorance) can be transcended through Gyan Sadhana, but Sattvagun (mode of goodness) remains intact, and it can be transcended only through devotion. To qualify for the path of Gyan, one must be completely detached from the world of desires. On the other hand, the path of Devotion is open to all, for one must be neither too attached to, nor too detached from the world to follow this path. Even as one follows the path of Gyan, he constantly falls down, for he does not ask for the grace of God. He meditates on the nameless and formless Brahm. The devotee worships God with form (Shri Krishna), and is therefore given protection at all times. 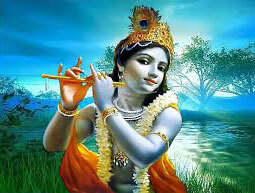 Shri Krishna declares in the Geeta, 'My devotee will never perish.' Gyani is like the baby monkey who holds on himself to its mother; while the devotee is like the kitten that is held protectively within the mouth of its mother. And if both the gyani and the devotee follow their respective paths and attain God, is there any difference in their respective attainment? Yes. The gyani attains atma-gyan. He then worships Shri Krishna and attains Brahm-gyan, eventually merging into Brahm. He now tastes the bliss of the Impersonal Absolute. 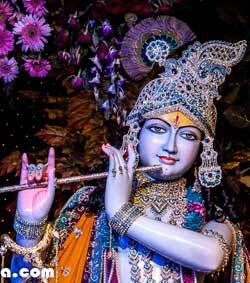 The devotee worships Shri Krishna right from the beginning, and attains Premanand (bliss of divine love). Though both are unlimited, Premanand is infinitely sweeter. They who had tasted BRAHMANAND: the fours sons of Brahma, King Janak, Shukdev Paramhans, and Shankaracharya, renounced it after tasting PREMANAND. We find three significant differences between Gyan and Devotion. It is most difficult to qualify for Gyan, but very easy to qualify for Devotion. Path of Gyan is extremely difficult to follow, whereas Devotion is very easy to follow. We find that Devotion is the only path that can lead one to God.